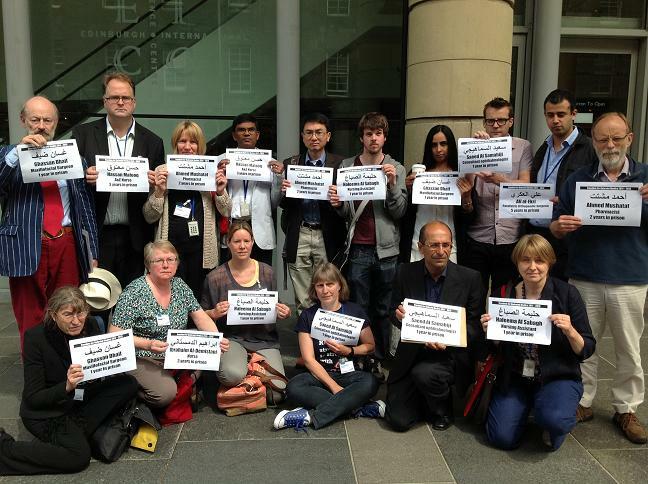 Delegates at the British Medical Association’s annual conference in June 2013 sent a message of solidarity to Bahraini healthworkers who have been jailed and tortured during the crackdown against protests in 2011. They gathered outside the conference centre, holding up the names of seven medical professionals who have all served prison sentences on trumped-up charges. Read more here about the repression in Bahrain and how healthworkers have been targetted by the authorities for giving care to injured protesters. Dr Mahmoud al-Fardan, an A&E doctor who was forced to flee Bahrain in 2011 after seeing dozens of colleagues arrested, will speak at a workshop organised by MENA Solidarity Network on 29 June. More details here.